UPC Party President Dr. Olara Otunnu, who is on a working visit to the United Kingdom, has established a contributory link between President Yoweri Museveni’s role and the war crimes for which Congolese warlord Thomas Lubanga was convicted by the Hague-based International Criminal Court [ICC]. In an exclusive interview with this news paper, Dr Otunnu started by welcoming the conviction of Thomas Lubanga. “I am happy with the conviction. Actually, it’s the first conviction of the ICC since it was established in 2002,” Dr Otunnu said in reference to the March 14 judgement. Commenting on the specific charge of recruiting child soldiers for which Lubanga was convicted, Otunnu, a former UN Under Secretary General for Children in Armed Conflict, also highlighted his role in framing the war crimes offence. “The three charges against him were all to do with the recruitment and abuse of children,” said Otunnu, adding that: “In fact, the particular provision in the Rome Statute under which Thomas Lubagnga was convicted is something I drafted myself.” Otunnu said. The UPC leader also wasted no time in establishing a firm link between Lubanga’s crimes and Uganda’s role in aiding and abetting those war crimes. “Lubanga was a relatively small player in the DR Congo. What gave Luganga his power and sway in the Congo was actually sponsorship by Ugandan leaders,” Otunnu said. Dr Otunnu, a Harvard trained Lawyer, also said he believes that Ugandan leaders and commanders are legitimate suspects for prosecution under the Rome Statute. “The little fellow [Lubanga] who was manipulated from Uganda been charged, but the real fellows who were in charge of his crimes are walking scot-free. That is what is wrong with the application of the Rome Statue.” Otunnu charged. He said he told ICC Chief Prosecutor Luis Moreno Ocampo that the ICC’s process and choice of those to be indicted has been highly politicised and highly selective. “I still very much hope that what was done inside Uganda, on Ugandan territory and elsewhere in Congo will be punished. 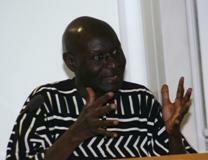 I hope to see a day of reckoning when the ICC will investigate and bring them to book for what they did.” said Otunnu. “Thomas Lubanga was not a hugely significant player in the overall scheme of things.” Otunnu maintained. END. Please login to www.ugandacorrespondent.com every Monday to read our top stories and anytime mid-week for our news updates.